Assistance at your arrival to Lima. Take flight to Cusco. Watchtower which guarded the city entrance. Return to Cusco. Accommodation in Cusco. of the Incas. Visit to the picturesque Indian Pisac Market held on Tuesdays, Thursdays and Sundays, the shopping paradise of the Andes where barter is still practiced. Enjoy the unique atmosphere during a typical lunch. In the afternoon, passing through the Towns of Calca and Urubamba, we visit the Inca Fortress and Citadel of Ollantaytambo, built to guard the entrance to this part of the Valley, and protect it from possible invasion from the tribes in the Lower jungle. You can walk through the quaint streets of the nearby Town, and get a good idea of what this Strategic Military, Religious, and Agricultural Centre was like during the era of the Inca Empire. On our way back to Cusco we stop of at the picturesque Andean village of Chinchero to visit the ruins of the Royal Hacienda of Tupac Inca Yupanqui. 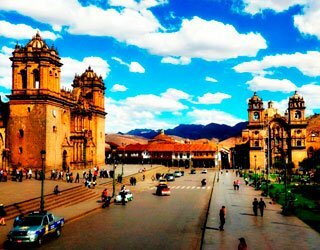 We will admire a well-preserved Inca Wall in the Main Square, and visit the beautiful Colonial temple built on Inca foundations, with interesting frescoes in the portico. Late afternoon return to your selected Hotel for overnight. Evening free. We suggest strolling around the Main Square and enjoy the night atmosphere trying a delicious Pisco Sour in some of the many pubs around the Square. Note: The visit to the Village of Chinchero depends onthe time available. Pisac Market only Tuesdays Thursdays and Sundays. At according time transfer to the Railway Station to board the train to Aguas Calientes, immediately we will board the bus to go up the winding road to one of the 7 Wonders of the Modern World chosen by the NOWC* organization “The Sanctuary of Machu Picchu” located amid mountains and flanked by steep deep canyon formed by the Urubamba river, you will have a guided tour of the citadel where we can see three sectors; in the first you are able to observe the sacred district, in the second you can see the quarter of the priests nobles and the residential area, in the third sector you will appreciate the popular neighborhood located in the south of the citadel among other architectural attractions. Finishing this wonderful experience we descend to Aguas Calientes to board again the train to return to Cusco, you will be driven to the hotel. Accommodation in Cusco. Transfer to the Airport to board your flight to Lima. Arrival, reception and assistance to connect your international flight to Iguazu Falls. Arrival and transfer to the hotel. Accommodation in Iguazu. 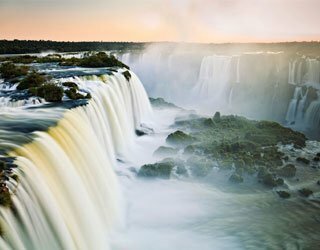 A local guide will show you the Falls from the Brazilian side. The two-mile-wide torrent is nothing short of spectacular. The rainbows, thundering roar and plunging cascades of water make this truly one of nature’s wonders. Your afternoon and evening are at leisure. Today began our spectacular excursion to the famous Argentine side of Iguazu Falls, these ones have 275 jumps that are visited by several entrances, the walkways approaches the passenger to the falls, every viewpoint balcony contains the sharpness of a Postal, the falls are in the middle of a large subtropical vegetation full of tree ferns, birds and wildlife that makes an unforgettable experience, it starts at the Visitor Center and travels through the upper circuit, lower circuit and finally the “Garganta del Diablo”, we will also visit the Center for ecological interpretation. Return to the hotel. Accommodation in Iguazú. 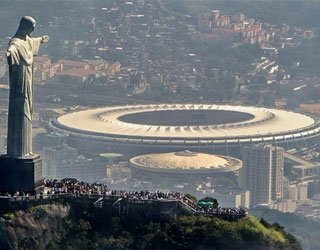 Join an exciting full day tour of Rio. Start with a cog-train ride up Corcovado Mountain. Disembark and walk up to the top lookout where the towering statue of Christ the Redeemer stands. Then, descend by train and pass by Rio’s world-famous beaches to board a cable car for a two-staged ascent up Sugar Loaf Mountain. Enjoy the spectacular views of the city before traveling down and continuing on to see the main sights. Your evening is free.